Lions and Cheetahs Are Dancers in Africa's "Carnivorous Ballet"
The lion, as they say, is king of the jungle. More accurately, it might be called the king of the savannah. It was once thought that lions posed a serious risk to other, smaller carnivores, like cheetahs and African wild dogs, but new research suggests that things aren't quite so clear-cut. Once upon a time, a researcher documented the big cats attacking and killing up to 57% of cheetah cubs in Tanzania's Serengeti National Park. But what's weird is that the lions (Panthera leo) don't eat the cubs, they just kill them. From that statistic, the idea was borne that lions and cheetahs (Acinonyx jubatus) are in direct competition with each other for the contest to see which cat would rule those of Africa's savannah ecosystems in which the two species co-occur. In addition, lions are thought to be bad for African painted dogs (Lycaon pictus). While canids, these beautiful creatures aren't related to domestic dogs. 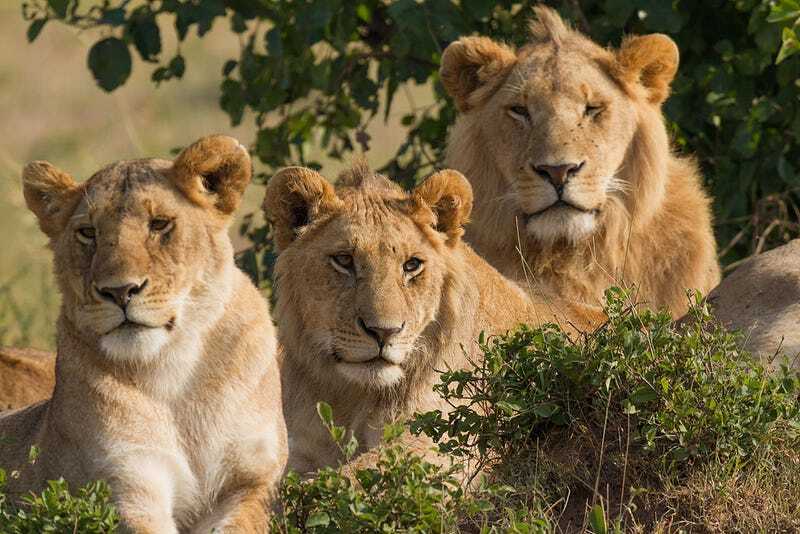 Within Serengeti Park, lion numbers increased by 300 percent over the last three decades, thanks to an improvement in the overall health of the ecosystem (for example, there were more wildebeest for the lions to eat). But as the lions recovered, the dogs suffered. Even though there was an overall increase in food available, from a small population of fifty, the painted dogs all but vanished from the park by the early 1990s. Small groups only persisted in areas free of lions outside of the park's official boundaries. Before they were driven out, some 32% of painted dogs died because of lions. It seemed as if lions were just big, mean bullies, suppressing all the other meat eaters in the neighborhood. And nobody was sure why, since the carnivores didn't compete for the same food sources, in general. It seemed like conservationists were going to have to pick between the lesser of two evils: save the lions, at the risk of imperiling the cheetahs and painted dogs, or cull the lions to boost the cheetah and dog populations. Neither option seems very palatable. But new research accepted for publication in the Journal of Animal Ecology suggests that the lion-cheetah-painted dog ecosystem isn't quite so simple. The researchers, led by graduate student Alexandra Swanson of the University of Minnesota's Department of Ecology, Evolution, and Behavior, began by compiling thirty years' worth of demographic data on the three species from Serengeti National Park. To that they added spatial and temporal geographic data from radio-collared individuals of each species. They then compared their Serengeti data with similar assessments from fenced-in game reserves in South Africa to see just how generalizable their findings were. For the wild dogs, the results were consistent with the earlier ideas. Lions were driving them out, though that's mainly because the painted dogs go out of their way to avoid lions. To add injury to insult, Serengeti's painted dog population also suffered a dramatic decline in the 1990s due to rabies and canine distemper. On the other hand, contrary to preconceived notions, the cheetah population did not suffer at the hands (or jaws) of the lions. "Neither high levels of lion-inflicted mortality not behavioral avoidance inflict sufficient demographic consequences to translate into population-level effects," they write. Lions may be killing lots of cheetah cubs, but the cheetah population seems able to sustain those losses, and they don't actively avoid the lions, as the dogs do. In fact, radio telemetry data showed that cheetah territory actually overlaps quite a bit with high-density lion territory during the dry season. More surprising, female cheetahs chose high-density lion areas to give birth! That could be because both species seek out places with sufficient water and shade to raise their cubs. The researchers propose that cheetahs are simply better able to avoid detection by the lions. For one thing, they tend to stay at least 110 meters away from them. In addition, the two cat species have slightly different hunting styles. Lions prefer areas with more hiding spots and greater cover, while cheetahs chase down their prey in more open areas. It's what John Fryxell, a wildlife ecologist who was not involved in the study described to Science Magazine as "a sort of carnivorous ballet." In addition, the selective pressure of lions on cubs may have prompted cheetah populations to be able to rebound efficiently from cub mortality. After losing a litter, a mature female returns to estrus in just two weeks. And the pattern holds up. In South African reserves, painted dog populations decrease as lions increase, but lions have no real effect on cheetah demographics. The loudly chattering painted dogs, which travel in packs, are a much more salient target for a lion defending its territory than a quiet, stalking cheetah. For cheetahs, the main variable that predicts their population size is simply the size of the reserve. Much of cheetah conservation work has focused on lion-free ecosystems, or on the culling of lions, because of faulty notions about lion-cheetah interactions, but this research suggests those may be inappropriate strategies. A more scientific, empirically-driven conservation plan is one that takes a broader view of the delicate ecosystems in which these magnificent animals survive. Life is hard enough for a cat on the African savannah without having to contend with human-driven conservation efforts founded upon faulty assumptions. Images: Lion family, Benh Liu Song/Wikimedia Commons; Cheetah, William Warby/Wikimedia Commons; Painted dog, Mikkel Elbech/Wikimedia Commons.